In this week’s economic update, we map out the Brexit timeline, focusing on key dates and potential outcomes before heading over to the US to discuss the Federal Reserve’s decision to leave interest rates unchanged. 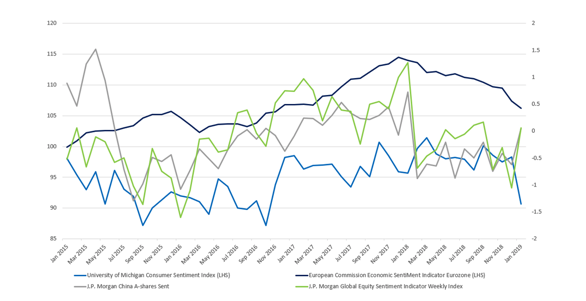 In our third and final article of the week, we delve into the topic of sentiment, what it means and are current levels justified against a backdrop of strong fundamentals? Brexit: What is to come? Are the Fed Putting Interest Rates to Bed? Despite strong economic growth and falling unemployment across most developed economies in 2018, the year ended on a sour note. An array of negative, mostly country specific, idiosyncratic factors started to paint a rather bleak global economic picture. Sentiment indicators started picking up on this and are now turning down. A key aspect throughout, and persistently of concern to investors, is the leading role played by the Chairman of the US Federal Reserve (Fed), Jerome Powell. His decision to raise interest rates four times (quarter-point increases) in 2018, caused angst. He put on show a hawkish stance. Put simply it looked as if he was on a mission to increase interest rates even if it meant economic growth suffered a hard knock. Earlier this week, Mr Powell made a statement regarding the decisions taken by the Fed in regard to recent interest rate moves. To the relief of ‘Fed watchers’ and investors, Mr Powell indicated that further interest rate rises will be put on hold. Alongside this clear indication he acknowledged risks to global growth by tightening monetary policy too much. Fortunately, he can point to temperate inflation as justification for putting rates on hold, thus avoid any accusations that he is bowing to pressure from Donald Trump who last year warned him against raising interest rates. For now it appears interest rates will remain steadfast at 2.25% – 2.5% with the Fed appearing keen to maintain growth for as long as possible. Late last year, officials indicated interest rates would possibly rise two or three times, but now economists believe a reduction in monetary tightening is not out of bounds, if growth falters from here. Psychology plays a large role on investment decision taking. Thus ‘sentiment’ impacts the prices of assets, particularly in the short term. In very simple investor speak, if asset prices are inflating it indicates bullish sentiment; the opposite termed bearish sentiment. One danger associated with markets being unduly influenced by emotions and sentiment is that prices can depart, often meaningfully, from their fundamental characteristics. Another expression used for fundamental characteristics is intrinsic value, a term used by Benjamin Graham the so-called father of investing. Smart investors, particularly those following momentum, spend a lot of time studying sentiment, looking for technical signals to help them gain an edge. Contrarian investors look to take advantage of these short-term trends exploiting over and under valuation opportunities. Multiple factors lie behind shifts in sentiments: Examples include over exaggerated fears or hopes and even fears about market volatility itself. The tendency to exaggerate can be applied in many different settings – monetary policy, geopolitics, interest rate setting etc. The chart above contains a variety of sentiment indicators. At first glance, without going into any detail, wild swings are immediately obvious. However, if you focus on the lines to the right, from late 2017/early 2018, sentiment started to drop. This is perhaps not too surprising given the many uncertain geopolitical events unfolding throughout last year. Sentiment however, isn’t always the most reliable indicator. 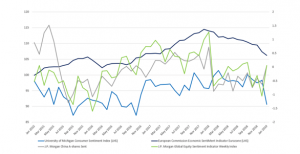 For example, in the UK around the time of the Brexit referendum result, consumer confidence collapsed, but the share prices of mid-sized companies, represented by the FTSE 250 index, bounced back even though they have a clear domestic focus. In other words, sentiment soured but was ignored by investors focusing on what was actually happening. We now know the economy did not collapse as many feared at the time. As we fast forward from the point of collapse in consumer confidence over the Brexit result we can see that sentiment has improved. It hasn’t returned to previous highs, and is still sluggish and in negative territory, but we can hardly be surprised given the media onslaught about potential food shortages and higher prices emanating from the ‘no deal’ Brexit debate. What about UK economic fundamentals- what are they telling us today? Growth in the UK is trending a little lower and inflation a little higher compared to other developed economies, however not remotely as bad as the forecast provided by the Bank of England when they implemented an emergency rate cut in the aftermath of the result. Were they responding to exaggerated fears? Probably. We know that the emergency cut wasn’t needed because it was reversed. Interest rates remain low but at least they are not on the floor as in Europe where emergency monetary policy measures are still needed. In the UK low unemployment is the major bright spot particularly when compared to Europe. In conclusion, sentiment can be measured through various indices. The outcomes shown capture emotions that can be exaggerated but resonate with the mood at the time.